International law won’t solve all of Asia’s problems. In fact, it could exacerbate them. Recently a number of scholars and observers (here, here, and here) have argued that the best way to resolve Asia’s current territorial disputes is to refer them to international law. They argue that international arbitration by an impartial third party could reduce tensions. Despite the insights in such arguments, we should also realize that there are limits to international law and thus other alternatives should not be neglected. One reason that we should not be overly optimistic about the role of international law in regulating disputes between states is that, according to some legal scholars, there are certain limits to international law. Such laws are instruments used by states in pursuing their national interests. In other words, states are rational actors and they will use international laws when laws serve their national interests and they will discard international laws when laws hurt their national interests. Some examples include the U.S. decisions to withdraw from the Anti-Ballistic Missile Treaty with Russia and invade Iraq in violation of the U.N. Charter. And it is not just powerful states that do this; small states do the same whenever it is convenient for them to do so. When smaller states seek help from international law, they do not necessarily believe in the principles of international law; they just want to use international law to constrain bigger states for their own national interests. One could also argue that international laws often just reflect the interests of strong states. That is to say, international law is never impartial. Judges are human beings too; and their personal feelings will influence their decisions. It is also likely that their views are shaped by global public opinions in one way or another. Thus, there is no guarantee that judges do not possess biases before they decide on a case. Although this point is debatable, it makes us reconsider the argument that international law is always impartial in deciding cases. Moreover, when stakes are high, international law is of limited value. It could even lead to domestic backlash, thereby leading to more serious conflicts and hurt the reputation of international law. Take the dispute over Diaoyu/Senkaku islands, for example. Even if both China and Japan agree to take the dispute to the International Court of Justice (a very unlikely scenario anyway), no matter what the final decision would be, it would anger either China or Japan, or even both. If the decision were to favor China then Japanese public opinion would be outraged and the same would happen in China if the decision were to favor Japan. A possible scenario then is that hardliners in both countries would call for tougher policies, including military policies, to resolve the dispute. Thus in an ironic way, international arbitration might increase rather than decrease the odds of war. Another problem of international arbitration is that it cannot resolve the complex issue of sovereignty and maritime rights. As the recent decision by the International Court of Justice in the Nicaragua v Colombia case shows, even if a party can successfully claim sovereignty over an island, for example, it might not be able to claim exclusive maritime rights. Thus parties still need to find alternative means of dispute resolution. 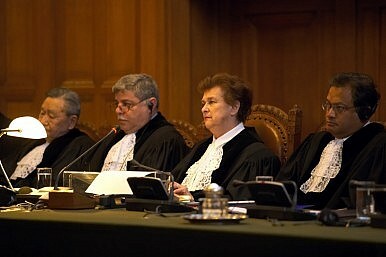 What is worse, a party might choose to withdraw from the International Court of Justice like Colombia did, or a party might continue to file new claims after the decision has been made, thereby hurting the reputation and effectiveness of the Court. One can easily imagine that the same could happen to Asian states if the ICJ or another tribunal made a controversial decision. Also, there is an implicit assumption in the international law argument that the sooner a resolution is reached, the better it is for Asia. This might not be true. Sometimes it is better to wait for another time to resolve the dispute when nationalism is low and stakes are not as high. The argument here is not that international law is useless or should not be used to regulate territorial disputes. It merely points out the potential pitfalls in international law. For territorial disputes in Asia, the best approach would be to shelve them for later resolution if the stakes are too high and parties cannot reach agreements at the moment. Ultimately, the primary question is whether the rule of law in international relations is possible. Although rule of law is a lofty goal in international relations, states should be patient as they push for the rule of law in resolving disputes. As an old Chinese saying would remind us: 欲速则不达 (haste makes waste).